on The Bold and the Beautiful. 1966: On The Guiding Light, Bill Bauer's (Ed Bryce) behavior worried his family. 1968: George Reinholt debuted on Another World as Steve Frame. At Walter (Val Dufour) and Lenore's (Judith Barcroft) wedding reception, Steve arrived, introduced himself to Alice (Jacqueline Courtney) then led her to the dance floor. Steve and Alice would go on to become one of the most popular couples in soap opera history. 1974: Actor Edmund Hashim died at age 42. His soap roles included Wayne Addison on Another World and Wilfred Block in Dark Shadows. 1974: On Days of our Lives, Alice (Frances Reid) tried to calm a distraught Tom (Macdonald Carey) after Addie's death. 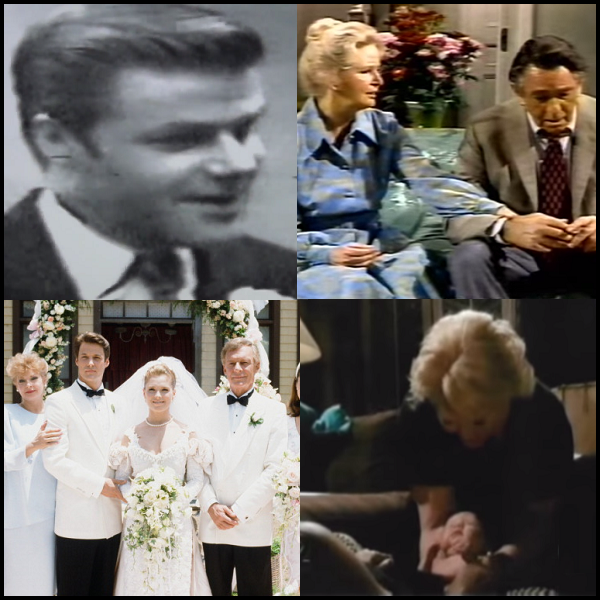 1976: Former Days of our Lives head writer Kenneth M. Rosen died at age 47. 1980: On The Edge of Night, word spread that Draper Scott (Tony Craig) could be alive. 1987: Guiding Light's 50th Anniversary week continued as the Bauer Barbecue kicked off. A grown up Alan-Michael Spaulding (Carl Tye Evans) parachuted into the party. The episode ended with a flashback to The Four Musketeers' 1983 prom, introduced by Michael O'Leary and Grant Aleksander. 1991: On Days of our Lives, Jack Deveraux (Matthew Ashford) and Jennifer Horton (Melissa Reeves) were married. 1999: On Guiding Light, Reva (Kim Zimmer) overheard someone talking about the wedding of one of the princes to his assistant, Olivia. Crystal Chappell debuted in the following episode as Olivia. 2002: On The Bold and the Beautiful, Brooke (Katherine Kelly Lang) gave birth to Hope with help from Stephanie (Susan Flannery) and Bridget (Jennifer Finnigan). 2003: On The Bold and the Beautiful, Nick (Jack Wagner) and Massimo (Joseph Mascolo) waited anxiously by Jackie's (Lesley-Anne Down) bedside, bonding for the first time as father and son in this time of mutual concern. Meanwhile, Ridge (Ronn Moss) planned to tell Brooke (Katherine Kelly Lang) the truth about Nick, but when she wasn't ready to hear it, he took a different approach, pouring on the charm to try to win her back.